Last week we rolled out the latest major release of Stock Rover, V5.0. This blog post reviews all the changes and how you can take advantage of them. Stock Rover is now 100% mobile. Last year we introduced our tablet app, this year we are pleased to bring you our phone app for iOS and Android. The Stock Rover phone app can be accessed simply by logging into Stock Rover from your phone’s browser (soon to be in the Apple and Google Play app stores). Our website is not yet mobile (it will be soon), so for the fastest login, we recommend bookmarking the URL https://www.stockrover.com/sr/Phone (note the capital ‘P’). Stock Rover on the phone is meant to be light and nimble—it’s quick and easy to get a stock price quote, check in on a portfolio, and see stock market news, but it also offers some in-depth data and research capabilities. So even if you are stuck on a slow subway car or in a long line at the airport, you’ll still be able to gain valuable investment insights. 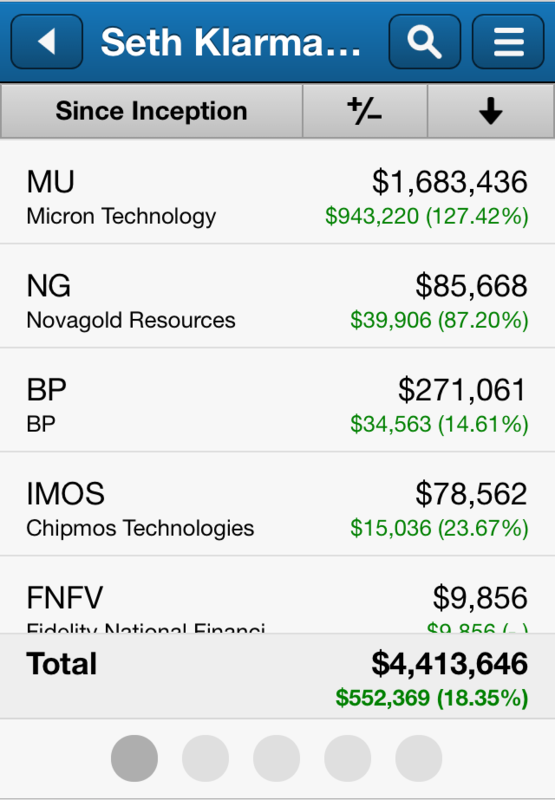 For example, with the phone app you can search for a quote, check in on your portfolio, chart two tickers against each other, and even run a screener. Let’s take a look. First, you’ll see the home screen, below, which lists all the datasets you can explore, including a list of recent tickers you’ve checked out. The three buttons at the top of the table, called out in red above, can be tapped to change what data is shown and how it is sorted. The total value of the portfolio is always visible. The left button lets you set whether you want to see gain/loss data from today or from the inception of the portfolio. 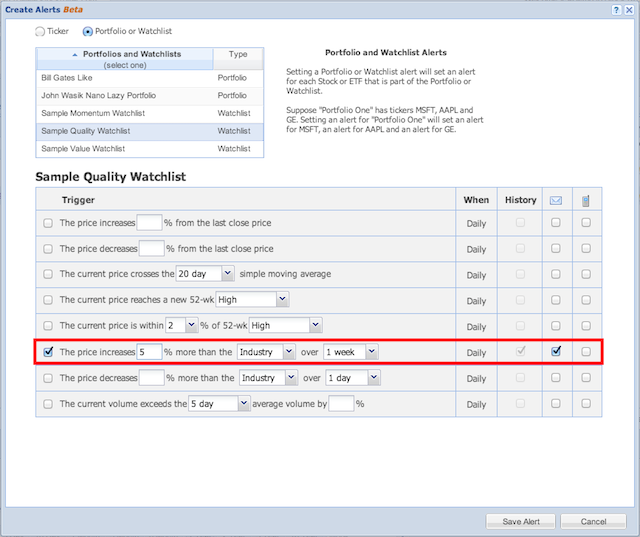 The middle button allows you to sort alphabetically (‘A-Z’), by portfolio value (‘$’), or by gains/loss in absolute terms (‘+/-’) or by percent (‘%’). The arrow button then lets you switch the direction of the sort. Test out these buttons to cycle through all of the options yourself (they may differ depending on what list you are viewing). Next, tap on any portfolio to see its holdings. 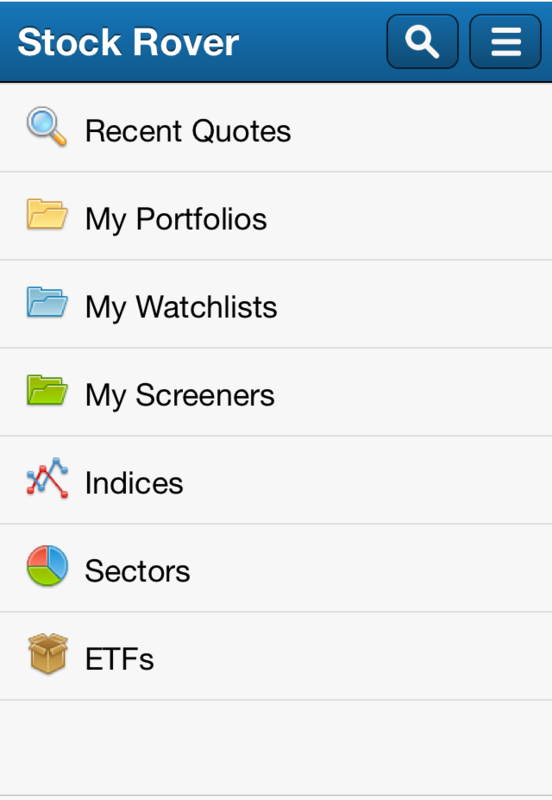 Notice in the screenshot below that five dots appear at the bottom of the screen, indicating that you can swipe for more information about this portfolio, including the portfolio’s chart and news. You can change the chart period using the button at the bottom, called out above. You can add a comparison ticker, benchmark, or technical to the chart using the ‘+’ button at the top right, also called out above. At the top of the window, select whether you want to add a ‘compare to’ item (selected by default) or a technical. Then, select what you want to add. Below I’ve added the ticker’s sector to the chart. Then I’ve tapped the sector name in the legend (circled) to instantly set it as a baseline. To undo the baseline, just tap the legend item again. So as you can see, while it doesn’t have the wide range of functionality available in main app, the phone’s chart is interactive and you can make meaningful comparisons quite easily. Visible in every screen of the phone app is the blue toolbar, which contains a search button and an account settings button. 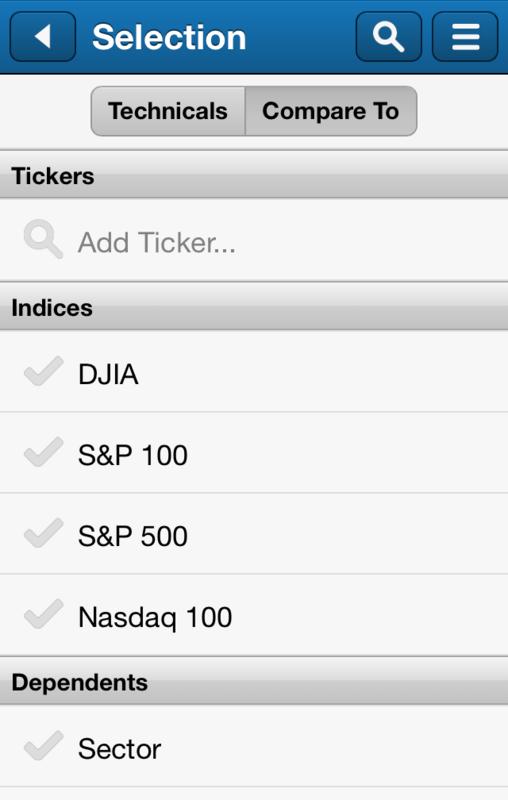 Use the search button to search for any ticker by name or ticker symbol. Use the settings button to see your account information, send us feedback or a question, or logout. In most screens you will also see a back button ‘<’ that will take you up one level of hierarchy in the navigation until you reach the home screen again. Nothing you do in the phone app will affect your account on the main app. However, changes you make from the main app will be reflected in the phone app—for example, if you create a new screener, you will then be able to run that screener from your phone. We hope you enjoy the newest member of the Stock Rover app family! This was just a brief overview, but we think you’ll find that the app is intuitive to use without much assistance. Try it out for yourself and let us know what you think. This release brings a major upgrade for Premium users: freeform screener equations. 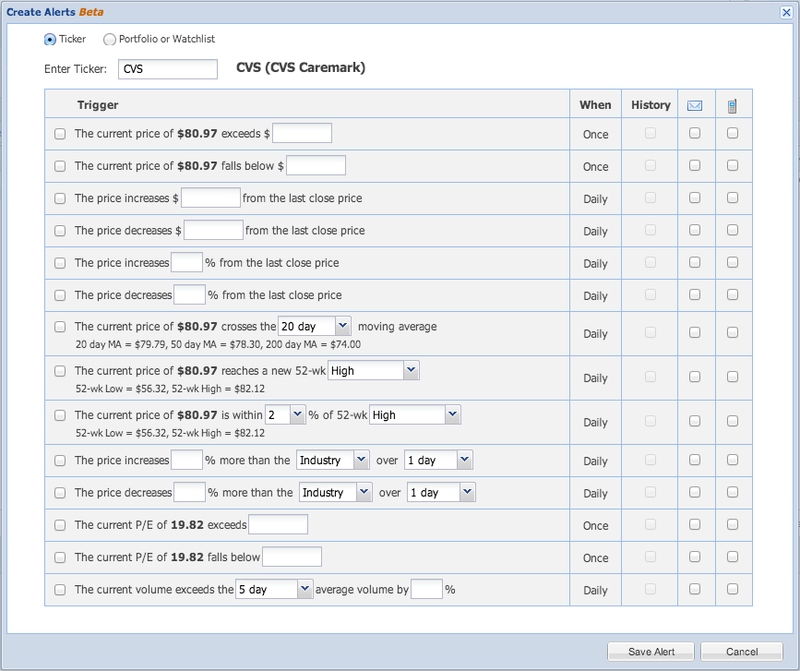 Screener equations let you directly compare two metrics, screen on historical data, and do arithmetic. 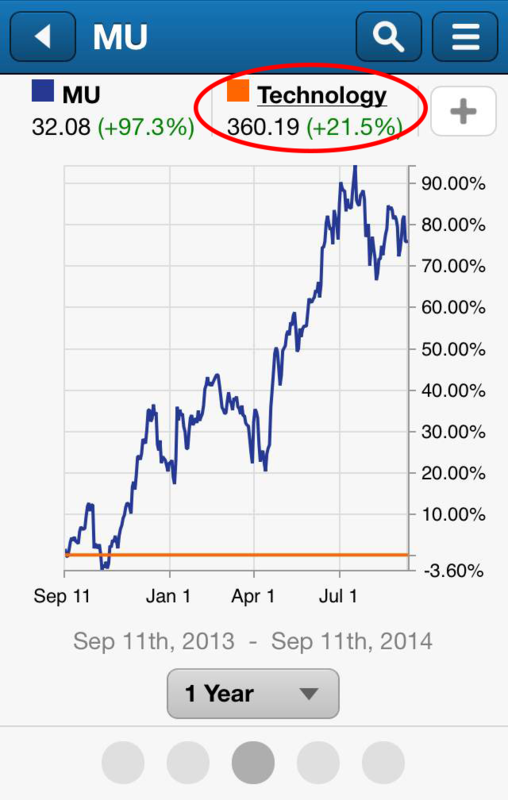 So, for example, you could screen for stocks whose sales have increased by at least 4% from last quarter. 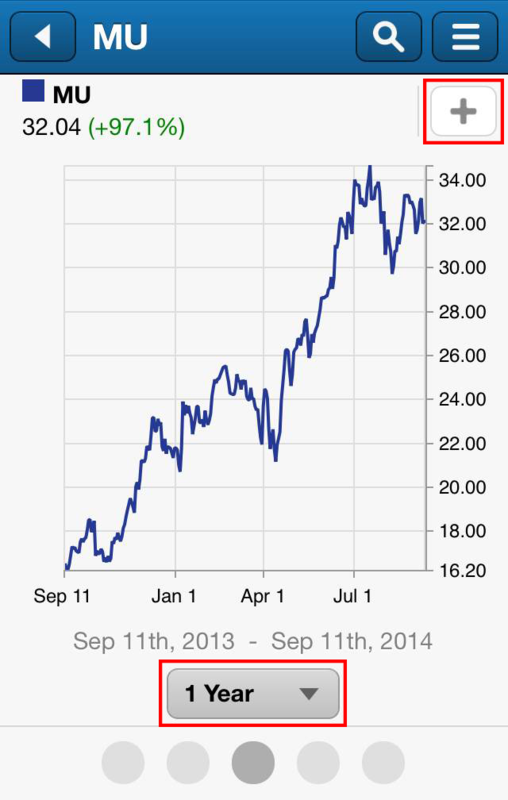 Or you could screen for stocks whose 50-day moving average is higher than the 200-day moving average by 10%. Practically any equation is possible. 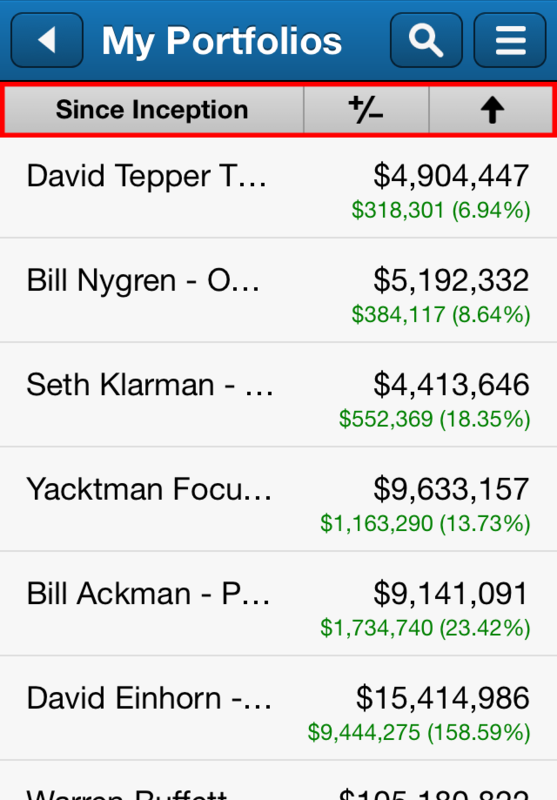 For a few ready-made examples, head to our library and check out the screeners Share Buyback, Momentum & Sector Outperformance, and EPS & Sales Growth (if you sort by Creation Date, these are the screeners from 9/8/14). 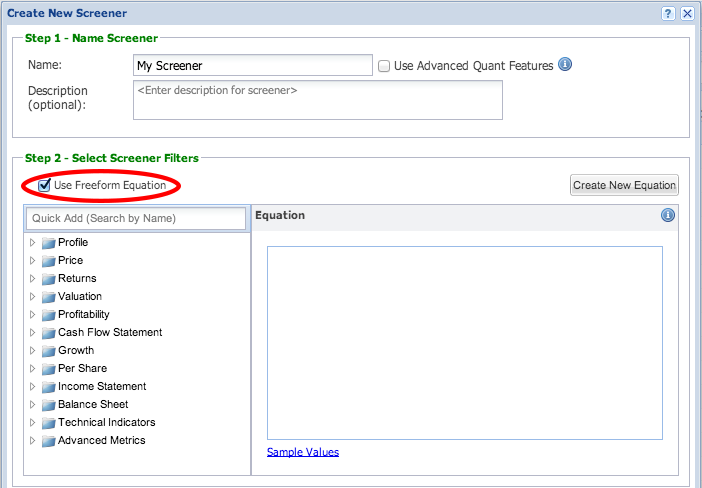 To create a screener equation, open up a new (or existing) screener form by right-clicking a screener and selecting ‘New’ or ‘Modify.’ Next, check the ‘Use Freeform Equation’ checkbox in Step 2, circled below. This opens up the screener equation box. You can now begin to type in the equation. You can browse or search for metrics on the left, or you can simply begin typing a metric in the form and select from the search results that appear, as below. The “Now” and “Q1” boxes are clickable, so you can select different time periods. Notice that you can use multiplication to set a specific percentage of change. 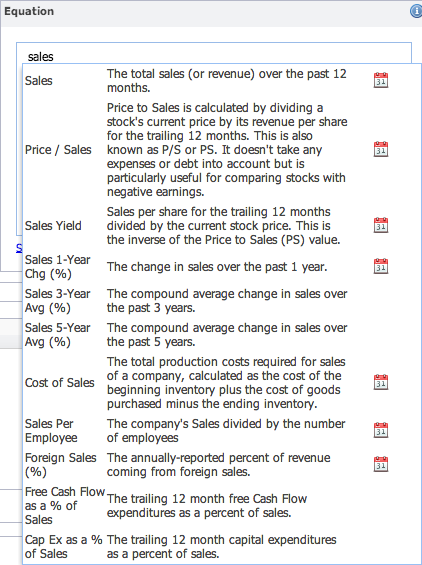 Multiplying by 1.04 in the above example ensures that stocks have increased sales by 4% or more over the last quarter (“Q1”). You can also divide, add, and subtract, and create and/or conditions. Once my equation is ready, I click ‘Save’ to add this equation to the list of screener criteria. Continue adding as many equations as you like until your screener is complete. You can always flip back to the original side of the screener form by unchecking the ‘Use Freeform Equation’ box. 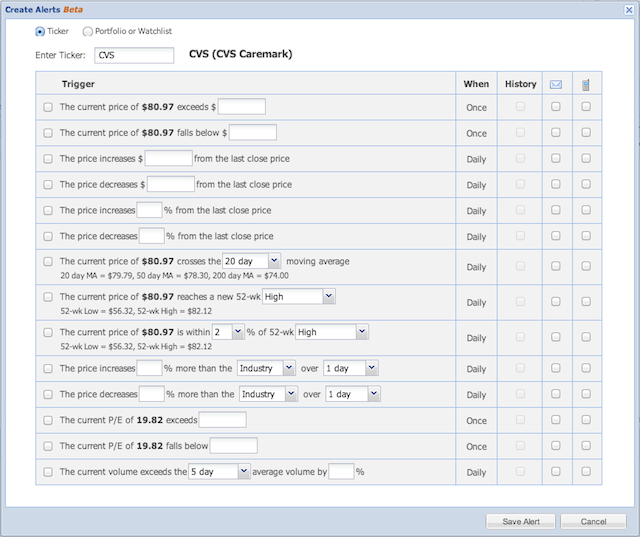 Think about the kinds of stocks you are searching for—how can you use screener equations to help you find them? In addition to the freeform equations, you can still use simple screener filters as well as ranked screening (formerly quants) to create a more targeted screener. Once you have a screener or two you like, submit it to the library to share with the wider Stock Rover community. 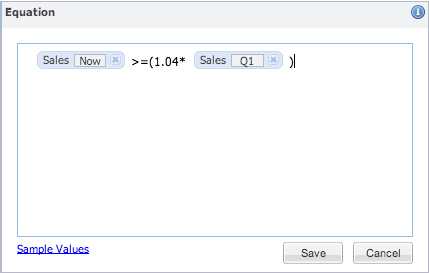 Equations have been one of our most requested features, so we are especially happy to be able to bring them to you now. We hope you enjoy them! For additional help on using screener equations see our How To Pages. The third major addition to Stock Rover with this release hasn’t actually been released yet. Alerts will be a Premium feature but they are currently still in beta testing by a volunteer group of users. These users have been sending us excellent, detailed feedback, helping us refine the alerts facility so that it will be ready for its close-up when we release it to all Premium users in just a few weeks. 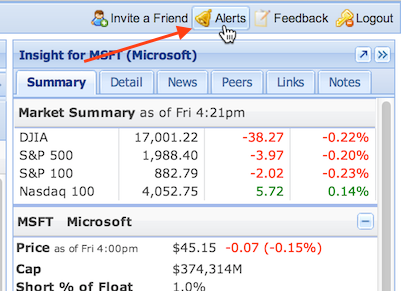 Alerts let you set specific trigger points on stocks you are following, so that you are notified when the trigger point has been reached. For example, you can be notified by email or text message when ABC crosses its 200-day simple moving average, when JKL exceeds its average volume by 50%, or when XYZ dips to exactly $42.50. 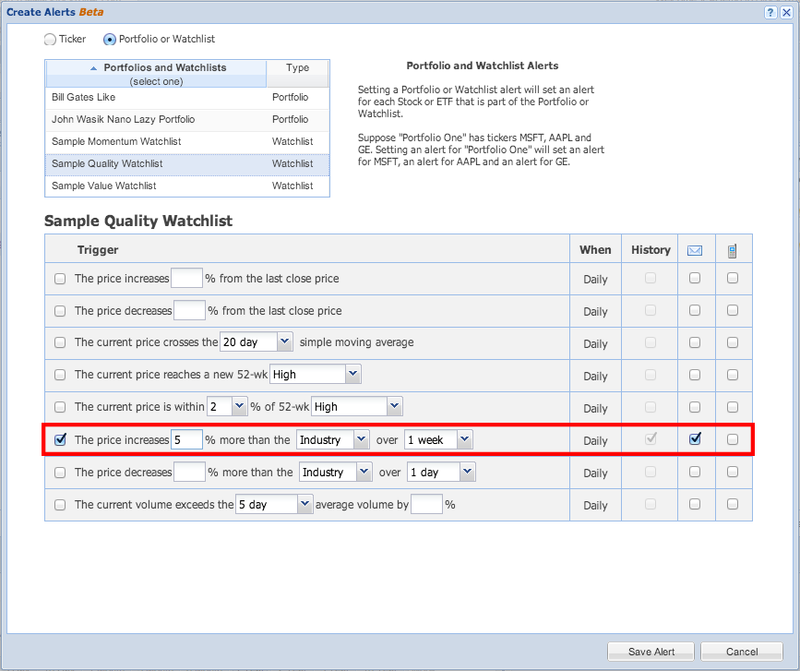 You can also set batch alerts for your entire portfolio or watchlist, so that if any stock in the bunch crosses a trigger point, you will be notified. Here’s a preview of the feature. Keep in mind that it is in beta, so the feature will probably change slightly from what you see here, but the heart of it will be the same. First, you’ll see a bell icon on the right-side of the top toolbar, shown below. You can select whether you want to receive the notification by text message or email or both (in the above screenshot, only email is selected). Now we’ll save it and see the complete list of alerts together, shown below. You can modify or suspend these at any time, or set up vacation mode (in red) to suspend all alerts. Notice the Alerts History tab, called out above, which shows you all alerts that have triggered in the past. Anything you haven’t yet viewed will show a temporary ‘New’ badge when you first view it. This was just a brief overview of alerts. For more, see our How To pages. Stay tuned for the full release of the feature in just a few weeks! We hope you will find it a useful and intuitive way to stay on top of important changes in your portfolios, watchlists, and any tickers of interest. The Target Price metric is now global, meaning a ticker doesn’t have to be in your portfolio for you to give it a target price. Add this column to your view and enter a target price (that is, the price you want the ticker to reach) for any ticker you like. 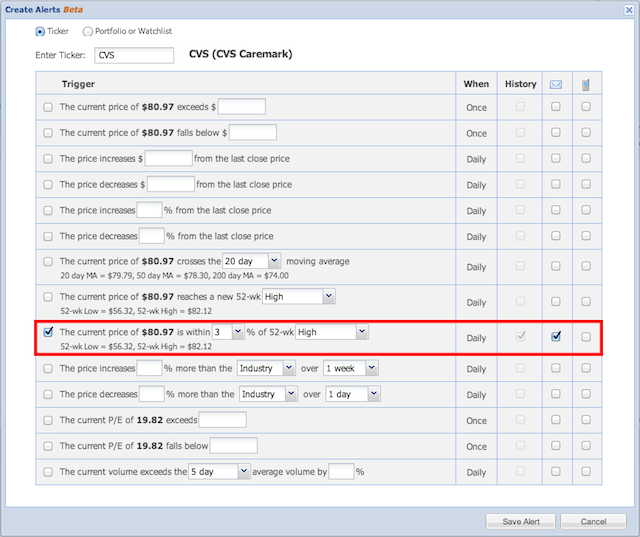 You can also add the Price to to Target (%) column for some perspective on how far a given ticker is from the target you’ve defined. Right-clicking a portfolio and clicking ‘Import’ will update that portfolio with the imported file. Right-clicking a portfolio folder (Premium) and selecting ‘Create’ will automatically add the new portfolio to that folder (previously it went into a folder called Default). The help links in the top toolbar have been reorganized, now contained in a ‘Help’ drop-down menu linking to our written help, videos, and support pages. You are now armed with the information you need to try out the latest upgrades. We hope you enjoy them! Please don’t hesitate to get in touch with questions or comments. Send them to us at feedback@stockrover.com, or through the Feedback button in the Stock Rover app.